An estimated 10 to 15 percent of the population in the United States has a condition called irritable bowel syndrome, or IBS. The gastrointestinal disorder is characterized by a series of symptoms including abdominal pain, cramping and changes in bowel movements. Although IBS is not well understood, dietary therapy seems to help many people. Talk to your doctor before changing your diet, particularly if you are taking medication. A low-fat, high-fiber diet is generally recommended for patients with IBS, according to the University of Pittsburgh Medical Center. However, every person with IBS has unique triggers -- foods or beverages that exacerbate symptoms or cause a flare-up. The Cleveland Clinic recommends keeping a food journal to discover your triggers, and make a food list tailored to your illness. Write down everything you eat with corresponding times, and take detailed notes about how you are feeling. Review the journal for trends. For instance, if you consistently have cramps after your morning coffee, you may need to eliminate the beverage. Dietary fiber can help bind loose stools and make hard, rocky stools easier to pass. 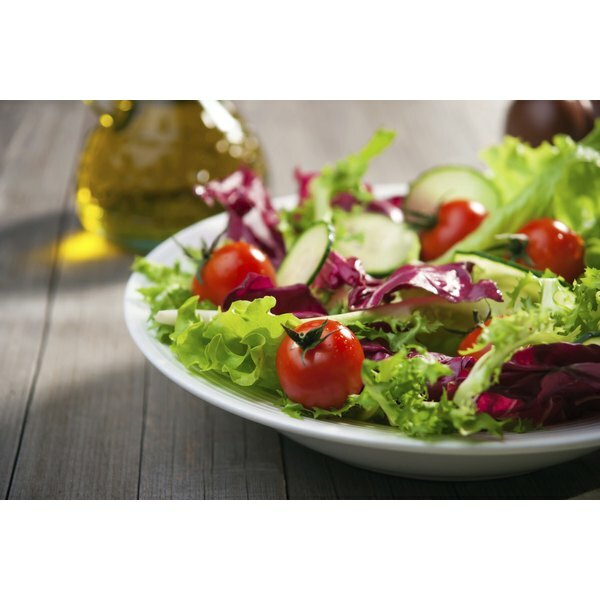 The UPMC recommends that people with IBS get 20 to 35 grams of dietary fiber per day. Foods with a high fiber content include fruits and vegetables, whole-grain bread, cereal and pasta, seeds, nuts and peas. IBS is an unpredictable illness and you may have to modify your diet as symptoms change. Certain foods -- beans, some raw vegetables and nuts -- can produce loose stools or make you gassy and uncomfortable, according to UPMC and the Cleveland Clinic. The same foods may have the opposite effect and can improve symptoms. Increase your fiber intake slowly -- by 2 to 3 grams per day -- to minimize your chance of ill-effects. If you have IBS with diarrhea or mixed IBS, chronic diarrhea may strip your body of electrolytes including sodium and potassium. To restore electrolyte balance, UPMC recommends nutrient-dense foods such as avocado, bananas, fish, nectarines, peaches, apricots, and boiled or mashed potatoes. To alleviate diarrhea, try binding foods such as applesauce, barley, oats, green beans and cooked carrots. Sensitivity to foods varies, but it's generally a good idea to limit your consumption of high-fat foods. UPMC recommends choosing low-fat dairy and baked, instead of fried, foods whenever possible. If you have trouble with diarrhea, a low-residue diet may be helpful. This means limiting raw produce and bran-based grains and opting for soft, cooked fruits and vegetables. Other foods which commonly cause IBS flare-ups include coffee, alcohol, artificial sweeteners, cabbage and other gassy vegetables, and some dairy products.